This is the classic fairy tale story of Rapunzel, originally written by the Brothers Grimm in their book, The Brothers Grimm Fairy Tales Collection. It was adapted & is brought to you by Stories to Grow by. ONCE UPON A TIME, there lived a carpenter and his wife. More than anything, they wanted a child of their own. At long last, their wish came true – the wife was going to have a baby! From the second floor window of their small house, the wife could see into the garden next door. Such fine fresh rows of plants and flowers there were! But no one dared to go over the garden wall to see them up close. For the garden belonged to a witch! "That lettuce looks so good!” said the wife. “It is just what I need to eat." "You thief!" yelled the witch. "You will pay for this!" “I will do anything!” said the carpenter. He thought, "Maybe I can build her something." "You say you will do anything?" said the witch. "But is it really so bad out there? Sometimes I hear people laughing down below," Rapunzel would say sometimes. At such times the witch would yell, "How many times do I have to repeat myself? Don't listen to anything you see or hear out there. The world is much worse than you think! You will stay in this tower forever, Rapunzel. So get used to it!" As she tasted a strawberry Rapunzel thought, "Now I know that what I was told is not true. The world can be a very fine place! I must get out of this tower as soon as I can." But how? One day, the prince said, "If only you could get out of this tower. I can come and go by climbing up the walls by holding onto your braid. But once I am down, how can you get down, too?" “Yes,” said Rapunzel, "I will." Every day after that, the prince brought a ball of silk to Rapunzel. Over time, she weaved the silk into a long ladder. 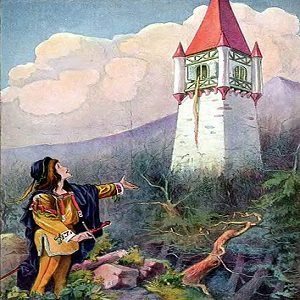 On Rapunzel’s 18th birthday the witch spoke to her in a sharp voice. “Before you open your mouth this time," said the witch, "know this. I am sick and tired of hearing you talk about how alone you are in the tower all the time. It isn't go to change, Rapunzel! Forever!" "You will never see this prince again!” yelled the witch. She took out a knife. Snip, snap, and Rapunzel's lovely braid was cut off! "So that is how he did it!" thought the witch. Holding tightly to one end of Rapunzel's braid, she threw the braid out the window. The prince took hold and climbed up. When he got to the window, he was much surprised to see the witch! And what happened next, well, I'm sure you can guess! The prince and Rapunzel went back to the kingdom where the prince lived. They were married as soon as they could. The prince became king of the land and Rapunzel became queen. The two of them lived happily ever after.